Well it seems like Jez is lost somewhere in the internet free abyss of Montana, so I thought I'd post this one on his behalf. 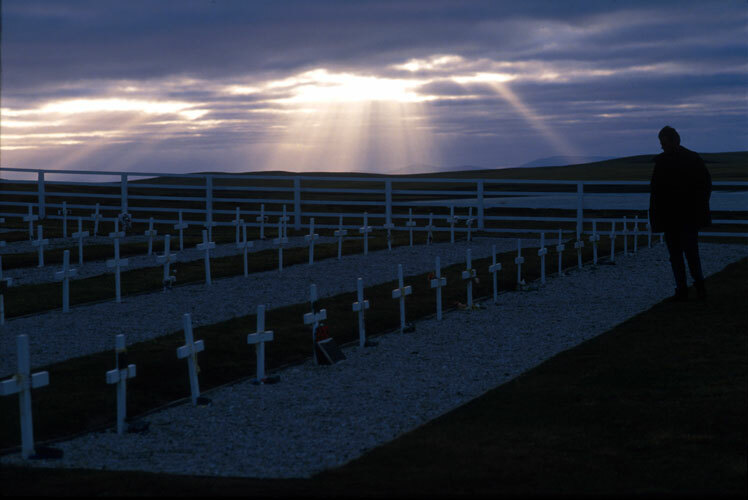 I'm just at the end of visit to the UK and it seems very fitting to post an image from the falkland Islands, since it is the anniversary of the ceasefire. I'll leave it for Jez to give some comentary on the image when he's back in range of a wi-fi signal. Yeah Matt, thanks for posting this above for the 25th anniversary of the end of the Falklands war......... it was kinda great to be lost in Montana and Wyoming ....... in Bear Country.......... not internet Country......... but in the end I guess its nice to be back to a bit of civilization......... kind of at least cos Im back in DC. Yeah the image above is of Ken ........ Ken Lukowiak my old friend........ Paratrooper and writer.......... poet and fighter....... crazy drinker........ absolutely decent man.......... fiercely loyal true friend........ here he is returning to the Falkland Islands 15 years after the war ........ he had been a member of 2 Para and had fought with his unit to retake the islands from the occupying Argentinean forces sent by their Military Junta ......... 2 Para had fought desperate actions in the darkness and watched their friends suffer and die........ they had rewritten the tactics manuals........ and come through victorious ......... but at a heavy cost to themselves and with even greater cost in lives to their enemy. Here 15 years after the battles were over Ken stands in respect at Blue Beach Cemetery where the Argentinean conscript soldiers who died in those battles are buried. Some young Falklands kids who had driven us out to this lonely place played music and chatted by their Land Rovers as if they had no idea what this place was. 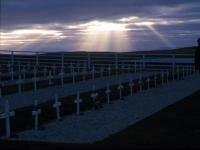 Ken angrily shouted at them to show respect "did they have no idea how many men were buried here?"....... "Not enough!"...... one joked back...... Ken exploded "You might not think that if you had to put them here yourself!" he shouted........Then they were silent........ Ken returned to his contemplation and his respectful visit to each grave.... he read their names but did not know the ones he had personally killed. This was as important a trip for the ex soldier as to the graves of his friends colleges and commanders. It was important it should be done properly and with respect. The light broke through the sky beyond, I tried to make photographs that befitted this moment. Very few if any of the British soldiers that fought here ever had the chance to return and walk these battlefields or pay their respects at the graves of the fallen. These desolate graves are kept immaculate but rarely ever visited. The government of Argentina refused to have the bodies repatriated as for them these men are of course already buried in Argentinean soil.